GOT Mobile makes it simple to access the information you need from anywhere. GOT Mobile better enables customers to run their processes more effectively by deploying information to devices equipped with a web browser. This phenomenal function on the GT25 & GT27 Series will help customers operate and monitor production equipment and respond to alarms quickly. Production data is easily accessible from any mobile and PC device at any time. 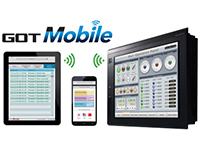 Combine GOT Mobile with a GT25-WLAN wireless access point to connect directly to GOTs from tablets, mobile phones or personal computers.